You don't have to be a jolly old guy with toys and reindeer to become a holiday legend. Just host one party that has people talking even after the snow has melted. "What you see in the first five minutes sets the tone for the night: how you are greeted, what you see and hear, the entryway, what the vibe is like," says Ziggy Eschliman, a party planner-turned-TV and radio personality known as "The Wine Gal." Set your walkway aglow with luminarias. If it's a fancy party, consider renting a red carpet and having a photographer act as paparazzi as guests arrive, Eschliman says. For Ziggy "The Wine Gal," a glass of wine is more than just a cup of fermented grapes. It's an affair with food and community that has earned her the coveted American Women in Radio and Television's Golden Gate Chapter's 2004 Kudo Award. Ziggy Eschliman, known to most simply as The Wine Gal or The Contessa of Cocktails, is among America's most enthusiastic, authoritative and entertaining libation experts. For over 20 years, Ziggy has set and reported trends in all things to imbibe. 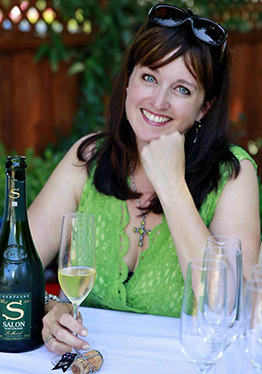 Her radio shows are broadcast throughout wine country and are available on the internet. As a leading American speaker, consultant, and wine writer, with personal experience extending from the hills of Tuscany to the streets of New Orleans, Ziggy is a driving force behind a national movement toward making wine hip, fun and accessible. As Ziggy plainly puts it, "...wine has been around for centuries; the mystery is so over. It's time to get past the stuffiness and clichés. They're simply a turn off to many would-be wine drinkers." While wine is Ziggy's stock in trade, her expertise isn't limited to wine. She also leads seminars on vodka, tequila, rum and a variety of spirits. As a wine and spirits educator, Ziggy has developed targeted wine programs for a diverse range of organizations and corporations including: Gourmet Magazine, the American Cancer Society, LeGrande Hospitality, Relish Culinary School, New Orleans Wine & Food Experience, IBM, PepsiCo, Benziger Family, KFC Inc., Meritage Alliance, So Co Farm Bureau, Showcase of Wine & Food, and Sinclair Communications. Most recently, she added a new credit to her list of accolades: Rock-n-Roll Sommelier, providing a world-class wine experience for legendary bands JOURNEY and HEART, and for RBP Concerts as well as for bands traveling with the LILITH FAIR. "Rock-n-roll and wine strike a natural chord and musicians create harmony for wine enthusiasts everywhere," says Ziggy. Ziggy took a well traveled path to wine education, custom crafting her expertise by tasting, reading and traveling wine regions throughout Europe and the United States. A former financial advisor, her first foray into wine came in the mid-1980s, when she became a private wine consultant to business executives. Then in the 1990s, as a partner in Tantalus Winery in Sonoma Valley, Ziggy drove all phases of the business; sales, marketing, distribution, vineyard development, harvest management, winemaking and customer education. This intimate connection to wine led her to develop what she calls her "terroir-driven passion." Her vast knowledge of and bubbling enthusiasm for wine and the enjoyment of it is unwavering and contagious. Eventually, the desire to share wine led to her first radio shows, the daily "On Tour," which promotes wine and food events & travel, and the weekly "Wine Wednesday," an extended broadcast that includes wine industry scoop, reviews, spirits, travel and a "Wine of the Week." Both air on Sonoma County's KRSH "The Krush- 95.9fm" and KNOB "Bob-96.7fm," which are owned by Sinclair Communications. Her insider status gives Ziggy access to prominent winemakers and industry luminaries. Discussions with notable winemakers and industry luminaries who have joined Ziggy on her "Wine Wednesday" show include: Gina Gallo-Gallo of Sonoma, Spencer Christian-ABC News, Dan Kosta-Kosta Browne Winery, Chris Benziger-Benziger Family Winery, Pierre Seillan-Verite Winery, Chateau Lassegue, Villa Arceno, Michael Green-Gourmet Magazine, Joel Peterson-President and Founder of Ravenswood Winery, Adam Lee-Siduri Winery, Rock stars Jonathan Cain of Journey, Les Claypool of Primus, John Lodge of the Moody Blues, and actress Jane Seymour.